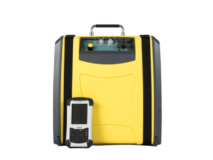 The Gasmet portable sampling system has been designed for portable emission monitoring measurements. It can be used for measuring trace concentrations of pollutants in wet, corrosive gas streams. The sample gas can be measured undiluted and without drying since the sample pump, heated filter and valve are all located in a module that is heated to 180 ºC. From the Sampling System the gases can be directed into Gasmet FTIR gas analyzer. The portable sampling system includes power connections and temperature controllers for heated lines and heated module. The unit is connected to an external PC through Gasmet FTIR gas analyzer and can be controlled by Calcmet software. For more information on other system parts please see Gasmet DX4000. The function of the portable sampling system is automatic, but sample pump and valve can be controlled also manually. The zero calibration of the Gasmet FTIR gas analyzer can be done automatically with the portable sampling system. 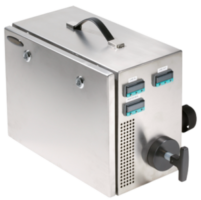 The sampling system can be equipped with a sample probe and / or heated lines.